Every jazz city needs its “Cheers.” As the refrain goes, it’s “where everybody knows your name.... and they’re always glad you came.” In the Twin Cities, the Artists Quarter in downtown St. Paul is our “Cheers” equivalent among jazz venues. Maybe just among venues, period. This weekend, the AQ celebrated its “Lucky Thirteen” years in downtown St. Paul, split nearly equally among its first Jackson Street location in Lowertown and the new millennial years in the lower level of the Hamm Building across from Landmark Center. I’ve at times likened the AQ to the Village Vanguard in Manhattan—it’s a no frills, basement-level venue with furnishings that have seen better days, a basic bar with no peanuts or pretzels, and home to a stellar sound system and nearly daily line-up of largely instrumental, bop and cutting-edge jazz. But at the AQ, you also get Midwest casual, a warm welcome from Davis Wilson at the door and owner Kenny Horst nearby, drinks with a smile from Dan or David behind the bar or delivered on busy nights by Sheila or Jane. And they do know our names, and they are sincerely glad we came. And we come often. Not to chat with our regular cohorts of jazz fanatics although before the music, between sets, after the show, the AQ is a relaxing room to just hang out with friends. But if you want to see and be seen, order a designer martini, treat the music as wallpaper, or order something from a bar menu, you need to head down the street or across the river. The AQ is a club for musicians and those who want to hear the music, and the music is jazz, never R&B, pop or whatever else so many jazz clubs have been booking lately to expand their patronage and their bottom line. 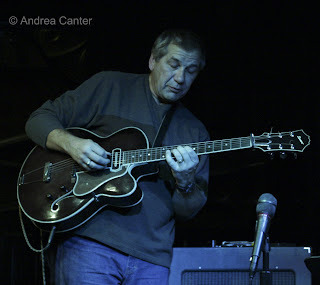 It’s always a struggle but Kenny has maintained the AQ as a jazz club, prompting some to declare that the AQ is the “only” jazz club in the Twin Cities. An exaggeration perhaps, but the point is well taken. You can have your jazz over easy, with the bebop delights of Dave Karr or the smoky vocals of Carole Martin. Or you can take your jazz shirred and poached, with the innovative twists and turns of the Phil Hey Quartet or Pete Whitman X-Tet. And you can take your jazz thoroughly scrambled by the surprising explorations of How Birds Work or the highly combustible Happy Apple. Best of all, you can take it nearly every night (Sundays often are open for private events) and the covers won’t give you sticker shock—weeknights are usually $5, weekends generally $10-$12. 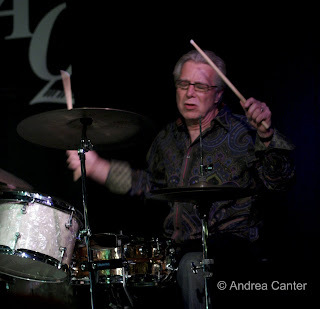 Even a legendary touring artist like Roy Haynes or Mose Allison won’t run more than $20-$25. Try that in Manhattan. Or even Minneapolis. Surely one of the factors in the AQ’s longevity, and certainly a significant part of its down-home, family atmosphere, is the partnership within Family Horst. Kenny runs the club—his “staff” consists of doorman, announcer and AQ poet laureate Davis Wilson plus the small bar crew. Wife Dawn is usually there on weekends, or more often, checking to be sure you are having a good time, clearing tables or delivering drinks when things get busy. Or singing the blues on stage if it is New Year’s Eve or another very special occasion. Son David is often behind the bar. Dawn’s mom Carole Martin is one of few singers on the schedule, and not often enough, we tell her. The anniversary party was everything AQ, from the seemingly endless line-up of some of the club’s most popular musicians to the free CD offered to patrons (“buy a ticket, pick a CD from our box of live recordings”) to the balloons and cake. 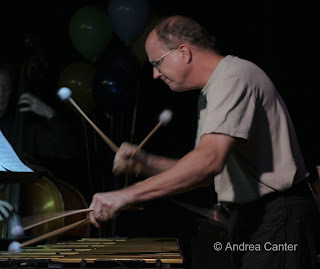 In true AQ fashion, music started late and ran late; the Tuesday Night Band must have forgotten the Sunday night gig and an ailing Pete Whitman had to bow out of the Pete Whitman Quartet. No matter, the house was full of AQ fans from aspiring high schoolers to retired bandleaders; the Whitman Minus Whitman Trio was arguably the hit of the evening, and super bass star Anthony Cox introduced a new band (“Shovel”) that was still raising the roof when I reluctantly climbed the stairs at midnight. Veteran drummer George Avaloz started off the evening with a bang, literally, as he is one of the more heavy-handed of area percussionists. But he also brings to the stage one of the most versatile saxophonists around, Jim Marentic, whose Coltrane interpretations were incendiary one minute (“Cousin Mary”) and stunningly lyrical the next (“Naima”). Peter Schimke, Gordy Johnson and Phil Hey came together for their first-ever trio performance, and even without Pete Whitman’s horn, they soared, gently dismantling “Round Midnight,” swinging abstractly through “All The Things You Are.” Surely this has to be the start of something good! The last two sets were the most adventurous in sound and concept. How Birds Work is a great opportunity to hear guitarist Dean Granros, another virtuoso musician who plays clubs too infrequently. It’s also a showcase opportunity for Kenny Horst. This is not a matter of a club owner using his venue to further his performance ops—Kenny delivers with the best in town. No wonder touring musicians are willing to stop by the little AQ in St. Paul—they know they will find great rhythm sections, and Kenny is a large part of it. Another of our great improvising guitarists, Dean Magraw, was on the stand for the last set with Shovel, led by veteran sensation Anthony Cox on bass with Chris Thomson on saxes and JT Bates on the drums. The music was odd and beautiful, ranging from high octane to sweet contemplation. Maybe there was more, I was fading but the music was still burning. And long may that little light of jazz, the AQ, shine on. Lucky thirteen... lucky us. 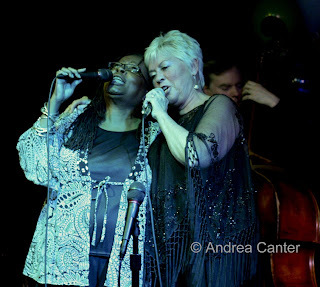 Photos: (top to bottom) Host Kenny Horst; Dave Hagedorn with the Phil Hey Quartet; Debbie Duncan and Carole Martin; Dean Granros with How Birds Work. All photos from the AQ's Lucky Thirteen party on October 19th by Andrea Canter.